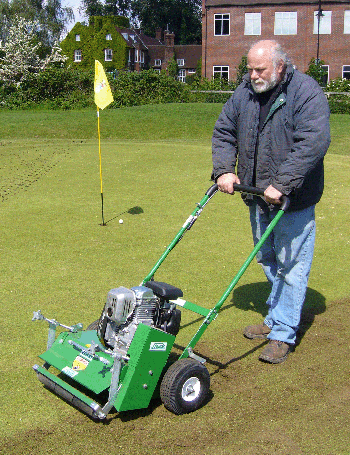 With a working width of 460mm (18") a bowling green can be scarified in around 60 minutes and a average golf green in approx. 30 minutes. Mounted with pneumatic rear wheels with grease able bearings on heavy duty steel rims, the front roller is mounted the depth of cut adjustment control, whihc is via dual quick adjust calibrated control rods with 1.5mm (1/32") increments giving a positive accurate setting.